Our daily lives are permeated by the past. Newspapers are full of commemorations of persons and occurrences we deem to be culturally and historically significant. Calendars are stuffed with births, deaths, battles, inventions, catastophes, riots, murders and miracles. “X hundred years ago today”, we are told, ships were sunk, saints were born, cures were found, and nations were freed. A quick look in the news for this phrase brings up articles about a flood, a battle, a constitution, a murder, a stunt and a railway journey. The BBC News dedicates a whole section of its website to looking back through the archives at what happened ‘On This Day’ X number of years ago. Google frequently changes its logo to celebrate “holidays, anniversaries, and the lives of famous artists and scientists”. What determines what we remember (and what we don’t) is no doubt the subject of countless books, articles, theses and seminars. Recently Mark Twain’s 175th birthday was commemorated in Tahoe, while it was noted that Tolstoy’s death was not commemorated in Moscow. Traditionally what ‘we’ choose to commemorate has been (at least in part) determined by all powerful newspaper editors, government officials and calendar publishers. Now digital technologies combined with an unprecedented amount of freely available, structured historical information allow us, at least in principle, to have a more personal relationship with the past. There’s nothing to stop us from being able to choose who and what we want to be reminded about, who and what we want to commemorate. There’s now a vast amount of readily available information that could be used to inform me about dates that I might interested in. For example, a quick glance on Wikipedia shows me that yesterday was the birthday of Thomas Carlyle and Rainer Maria Rilke, and today is the birthday of Christina Rossetti and Fritz Lang. It would be great to see an open web service that lets users receive notifications related to historical persons or occurrences they are interested in. This could be ambiently plugged into existing social networking sites, mobile applications, or website widgets. Users could say what kinds of people and topics they wanted to be notified about, or it could do something more clever like harvest and process relevant information from things like bookmarks, booklists, wishlists, citation lists, and so on, to guess what users were interested in. Journalists and critics could use the service to look for interesting centenaries, or serendipitously discover lesser known figures, or curious events that they may not otherwise have known about. Museums, libraries, archives and galleries could use it to highlight interesting items in their collections. Academics could use it to plan public lectures, or publishers could use it to commission new monographs or collections of articles. This kind of service (tentatively called ‘Historical Hooks’?) could gradually enable people to have a more dynamic relationship with the past, replacing centralised curation and filtering for what is ‘noteworthy’ by editors and event organisers with something much more distributed. This might mitigate some of the ‘bunching’ around Big History and Great Figures (e.g. heroes, geniuses, leaders, etc), and create opportunities for people to find out about more interesting minor figures: from poets, painters, and architects, to botanists, lawmakers and reformers. The long tail of commemorandia? 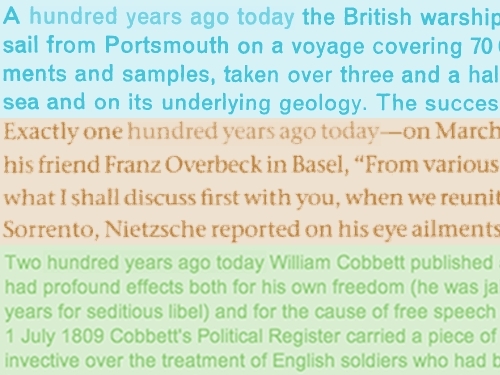 This entry was posted in digitalhumanities, history, ideas, intellectualhistory, notes, openknowledge, projects. Bookmark the permalink. Comments are closed, but you can leave a trackback: Trackback URL.